Halloween Chocolate Bark is quick and easy and makes a fun treat for kids and adults alike! This is an easy recipe, making it perfect to add this to your go-to list of Halloween Finger foods for parties or gifts to friends and family! This easy recipe, with just a few ingredients, is perfect to get the kids in the kitchen. 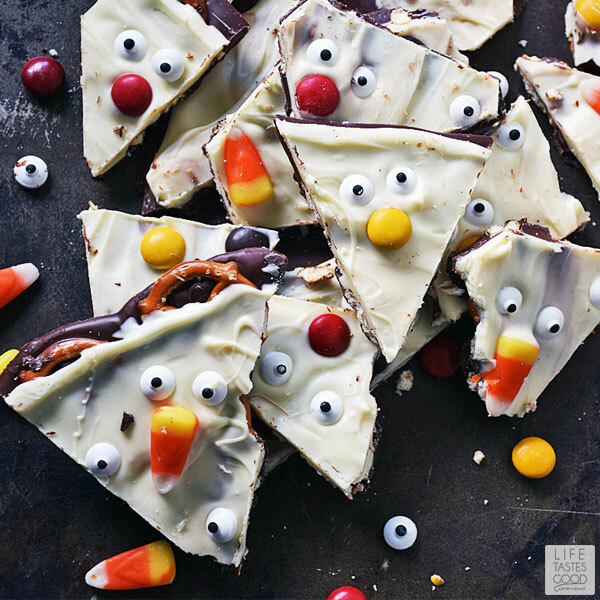 They'll love decorating the chocolate bark with not too spooky Halloween candy eyes, chocolate candies, and candy corn too. The pretzels sandwiched between the chocolate layers adds a salty twist to this sweet treat everyone will love! One of the easiest homemade candy recipes to make is chocolate bark. 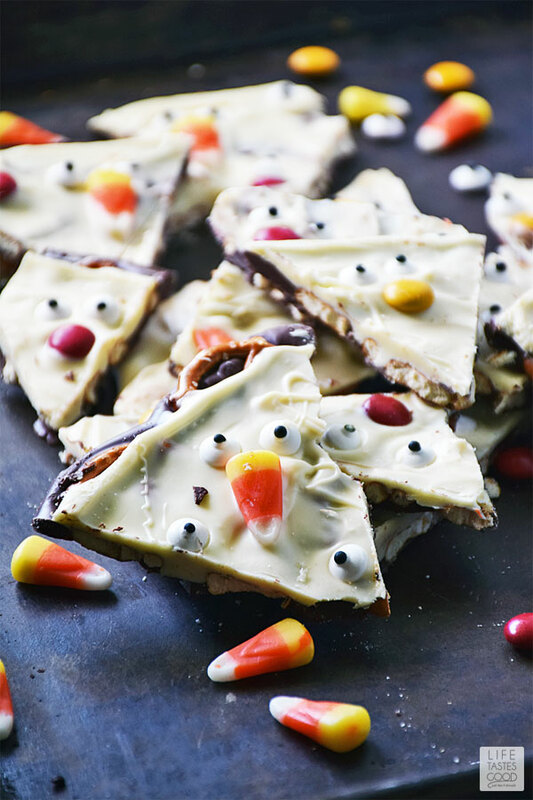 It's not only easy, but it's a fun Halloween finger food to make and share this Halloween Chocolate Bark with family and friends. Bark recipes are perfect to make for holidays because you can customize them for any theme you can imagine, they are delicious, and fun to make too. The kids love to decorate the bark, and melting chocolate is a good lesson in patience. It doesn't take long to melt chocolate, but if you heat chocolate too much too fast it will end up in a big hard ball that won't melt no matter what extreme measures you take! You can melt the chocolates using a double broiler or in the microwave. Using the microwave works just fine, takes less time, and makes less of a mess, so that is the route I go. If you use the microwave be sure to follow my directions below so you don't end up with a big hard ball of chocolate mess. For more Halloween Finger Foods recipe inspiration check out my recipe for Spiderweb Brownies and you'll find lots of Fun Halloween Recipe Ideas as well as our Leftover Halloween Candy Recipes on Sunday Supper Movement. This easy recipe, with just a few ingredients, is perfect to get the kids in the kitchen. Break 8 ounces of semi-sweet baking chocolate into pieces and place in a microwave safe bowl. Microwave on 50% power for 1 minute. Stir and then microwave again, on 50% power, for 30 seconds and stir until smooth. Microwave again, on 50% power, for 30 seconds. Stir until smooth. Repeat the process as needed until the chocolate is smooth. Note: Microwave oven power varies, so you may need to keep microwaving for 30 second intervals until the chocolate is smooth. Be careful not to scorch the chocolate or it will seize up and never melt properly. Pour the melted chocolate onto the parchment paper and gently spread evenly to about a 12x8" rectangle. Top the chocolate with the pretzels pushing each pretzel down slightly. Refrigerate about 10 minutes until the chocolate is set. Once the semi-sweet chocolate is set, break 8 ounces of white baking chocolate into pieces and place in a microwave safe bowl. White chocolate is very sensitive, and melts much quicker, so we need to be more careful. Microwave on 50% power for 30 seconds. Stir and then microwave again, on 50% power, for 30 seconds and stir. Microwave again, on 50% power, for 30 seconds. Stir until smooth. Repeat the process as needed until the chocolate is smooth. Be very careful not to scorch the white chocolate or it will seize and never melt properly. Pour the white chocolate over the semi-sweet chocolate and carefully spread the white chocolate to cover the pretzels. Try not to mix the two chocolates. Decorate with spooky candy eyes, round chocolate candies, and candy corn. Refrigerate until the chocolate hardens enough to cut into pieces. About 10 minutes. Cut or break into bite sized pieces and enjoy! NOTE: Times posted do not include resting time to allow the chocolate to harden in between layers. Line a baking sheet with parchment paper. Break 8 ounces of semi-sweet baking chocolate into pieces and place in a microwave safe bowl. Microwave on 50% power for 1 minute. Stir and then microwave again, on 50% power, for 30 seconds and stir until smooth. Microwave again, on 50% power, for 30 seconds. Stir until smooth. Repeat the process as needed until the chocolate is smooth. Note: Microwave oven power varies, so you may need to keep microwaving for 30 second intervals until the chocolate is smooth. Be careful not to scorch the chocolate or it will seize up and never melt properly. Pour the melted chocolate onto the parchment paper and gently spread evenly to about 8x12" rectangle. 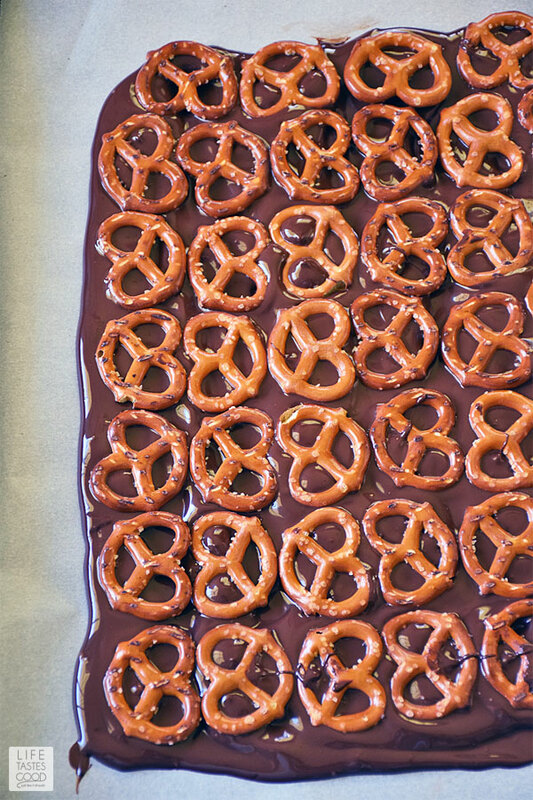 Top the chocolate with the pretzels pushing each pretzel down slightly. Refrigerate about 10 minutes until the chocolate is set. Refer to my photo tutorial for melting the chocolate on my recipe for Peppermint Bark Candy. 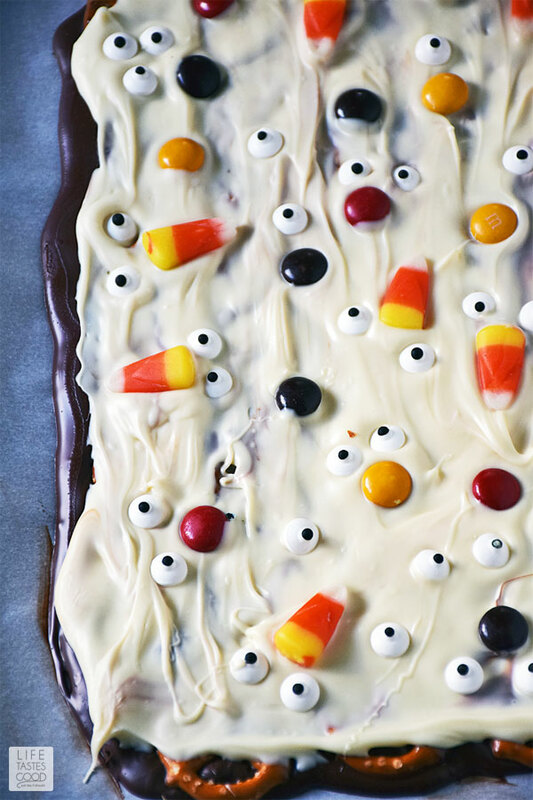 Decorate the Halloween Chocolate Bark with spooky candy eyes, round chocolate candies, and candy corn. Refrigerate until the chocolate hardens enough to cut into pieces. About 10 minutes. Cut or break into bite sized pieces and enjoy! 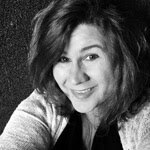 My recipe for Halloween Chocolate Bark was first published on Sunday Supper Movement where I am a contributor. Such fun, festive bark! Love the sweet, salty mix---I'd have trouble keeping my paws out of the bowl! I love that you stuck a layer of pretzels in there. The perfect combo of sweet and salty bites! What a fun thing to have on a dessert table! Easy and fun! I could eat the whole batch!